An annoucement today has really made me sit back and think. Chicago Public Library is considering laying off workers and I’m sure they are not the only ones. What library isn’t suffering from massive budget cuts right now? The economy is hitting its bottom, correct? I blame you...and you...and that short one in the middle. And this has been going on for awhile now. A quick Google News search pulls up many articles from the past year or so commenting on libraries during tough economic times, with headlines like: Patrons flock to libraries as the economy struggles. The news is the same. Patrons needs are increasing. Meanwhile library budgets are being slashed. This, my fair readers, is a huge mistake. This is the first image that comes up when googling "huge mistake"
Libraries, in every setting, are invaluable during these times. What has led us to this point? Ignorance and a lack of common sense or knowledge. I’m not saying the people responsible are undereducated. In fact many have their MBAs I’m sure. But there is a degree and then there is knowledge. And these can be two different things. Libraries provide information. They are the safety net in times of woe and in times of need. We are here to arm citizens with knowledge and information to prevent future economic crises. Knowledge is power...not just a cliche. Slashing budgets, cutting corners, laying off workers, decreasing hours. These are not the answer. Not right now. I am not saying that all libraries are in perfect fiscal working order. I’m sure some need fine tuning. But that is certainly not the case when CPL has announced it may be laying off over 100 workers, which is sure to hit every branch and every neighborhood. And for those people who think this isn’t possible, that people will not want to continue to fund libraries in times of need. Let us take an example, one I commonly turn to, with Kalamazoo Public Library. As mentioned in a previous post, this library went up for a millage renewal at a time when most libraries would never want to and this millage passed on May 5, 2009. This is a perfect example of a community that realizes it needs the library in times like these. So this is my argument for more, not less, when it comes to supporting our libraries in tough economic times. This is when people need us the most. This is our time to shine. But in order to shine, we need our funding and staff protected and maintained. Because we are not just the preservers of the past but also the building blocks for the future. If your library is having funding issues, contact your elected representatives and let them know about the importance of this issue. Have a great weekend fair readers. 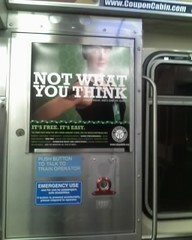 Just a quick note to say how much I totally love Chicago Public Library’s new ad campaign called Not What You Think!!! It’s totally fab and the website is fresh looking and very modern. Plus there is a hilarious picture of an old librarian spinning records. And also recommends the library as a quirky first date location. I just love it overall. So well played Chicago Public Library!! I look forward to seeing these ads on the train and grinning everytime I see one! Have a lovely week, fair readers!